By Marc, July 3, 2017 in Have a tip or idea? Human Centric Lighting simulate daylight over the entire day - from clear, blue morning skies, right through to the glow of sunset. They achieve this by gradually changing the spectral qualities and the colour temperature as the day progresses. This helps to improve concentration and increase productivity, for instance. Scientific studies have shown that biorhythmic lighting can reduce error rates in schools by 30 % and at the same time increase pupils’ speed of performance by 30 %. Similar results have been obtained in working environments, where productivity rose by almost 20 % and staff motivation improved significantly. In nursing homes and hospitals, the new illumination systems not only encouraged more activity during the daytime, they also had a positive effect on health and clearly improved night-time sleep patterns. • Biodynamic lighting with adjustable colour temperatures that facilitates the suppression of melatonin. • Lighting that does not influence the release of melatonin, with adjustable colour temperatures. Vossloh-Schwabe's first biodynamic COB module is capable of emitting approx. 3,000 lm of light and first trials are currently under way at various hospitals and universities. Humans are diurnal beings whose performance levels are deter-mined by the natural daynight cycle, in which regard daylight plays a decisive role in regulating bodily functions. Special retinal ganglion cells serve as receptors for nonvisual light stimuli that influence health and wellbeing. 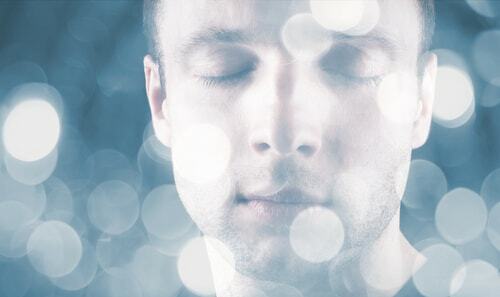 The effect of light on human biology is closely linked to the release of melatonin, which – among other things – serves to regulate our sleep-waking rhythm. The share of blue light that is perceived is decisive for the release of melatonin. The link between wavelength and its biological effects is characterised by the C(λ) curve. 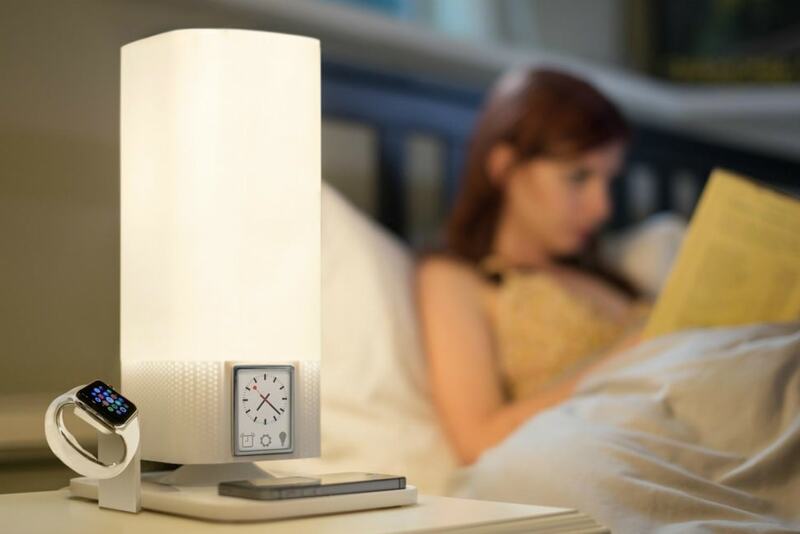 This "light alarm" facilitates a gradual increase in activity during the morning hours. 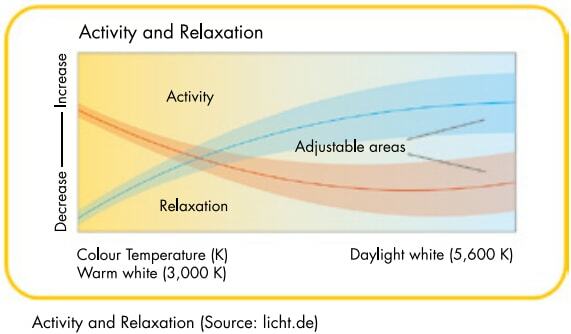 Light levels that are adjusted to suit different times of day with corresponding control of colour temperatures along the C(λ) curve exert a positive influence on both wellbeing and performance, while also ensuring a good night's sleep. Since our LED modules permit adjustments of this kind, they make a targeted contribution to activity levels and periods of relaxation. In addition to illuminating our world, light affects our health and the advances in LED technology are promising for public health. Scientists have long recognized that human metabolism moves through cycles that are synchronized with natural 24-hour “circadian rhythms.” Anything that interrupts those rhythms, including exposure to extended periods of bright light or absences of light, can affect a person’s health and psychological condition. For example, people who live in far northern or southern climates and who have little exposure to sunlight during winter months can suffer from “seasonal affective disorder”, which is a form of clinical depression. Recognizing this, lighting designers and engineers are now paying greater attention to how their products affect the health of individuals who are exposed to those lights. A person’s heart health, in particular, can be adversely affected by excess exposure to artificial lighting. As a day progresses and the sun sets, a person’s body will produce greater quantities of the hormone melatonin, which helps a person to relax and sleep during dark evening hours. When a person is exposed to too much sunlight or excess amounts of artificial light, melatonin production is impaired and that person’s sleep cycles are interrupted. Proper melatonin levels are also associated with lower blood pressure and platelet production, both of which are directly connected with heart health. Thus, an individual who experiences excess exposure to artificial light can suffer from hypertension and narrowing of arteries due to excess circulatory system plaque. Certain harsh, or high CCT-temperature light sources, can also affect a person’s vision and create excessive eye strain, leading to headaches and other discomforts. Lighting specialists suggest controlling, or at least moderating these health effects by focusing on lighting intensity and spectrum, as well as the timing and duration of the light that a person may be exposed to during a typical day. Light intensity can be higher during morning and afternoon hours to stimulate people and reduce any early-morning or afternoon senses of fatigue. As a day progresses, intensity levels should be reduced to ease the transition into a restful evening. 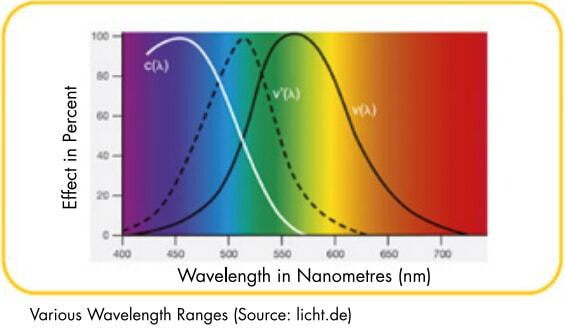 The color spectrum of artificial light will also have a great affect on a person’s health. Natural light, which has a color rendering index (“CRI”) of 100, is perceived to be ideal for many applications. Newer LED lighting systems are better able to replicate a natural CRI in almost every environment. LED systems also allow light spectrums to be changed during a day to better coordinate with CCT adjustments, all of which facilitates a healthier artificial light environment. Beyond intensity and spectrum, the timing and duration of a person’s exposure to artificial light may be more difficult to control. Awareness of these issues is a starting point for controlling them. Research is currently being conducted to determine optimal levels of light and how those levels can be adjusted and controlled to minimize health effects. Until then, building operators can take steps to reduce problems that artificial lighting can cause, including using diffusers on light fixtures to reduce harsh glare, and adjusting artificial lighting levels during evening hours to reduce impairment of melatonin production. Unlike conventional incandescent or fluorescent light sources, LEDs emit light at very specific wavelengths. Physiologists and psychologists have long understood how light can affect a person’s natural circadian rhythms. Consider, for example, the growing number of diagnoses of “seasonal affective disorder” that affects individuals in northern climates who have very limited sunlight disclosure during winter months. 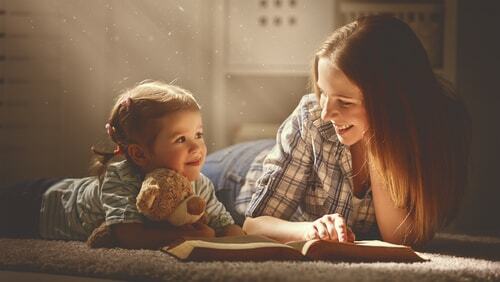 LED lights are now seen as a potential remedy for individuals whose circadian body clocks have been interrupted by environmental or other conditions. Certain blue wavelengths of light are known to depress a body’s production of the melatonin hormone, which is produced to help a person relax and fall asleep. With less melatonin in his system, an individual will feel more alert and productive. Natural sunlight comprises a greater amount of blue wavelength light during the central part of each day, causing individuals to be more alert during bright daylight hours. When natural sunlight is insufficient, highly-tuned LED light at the targeted blue wavelengths can be an effective substitute. Likewise, warmer-colored lighting can stimulate melatonin production and help a person fall asleep. These correlations can be used by a lighting designer to install and tune LED lighting systems in commercial, industrial, and residential environments. In a residential household, for example, LED lights can be configured to generate brighter blue-wave lighting during daylight hours, with transitions to warmer lighting in the evening. These lighting transitions can help to normalize a person’s circadian rhythms to allow the sound and restful sleep that is needed to recover from every day’s activities. Studies by international consulting organizations and health care providers have expanded on this use of LED lighting to form the broader concept of “human centric lighting” or HCL. This concept is not unique or specific to LED lighting, but it does focus on the health benefits of exposing individuals to variable wavelengths of lighting during the day in order to modulate mood-altering melatonin levels. Because of their versatility and ability to generate specific and highly-tuned light wavelengths, LED lights are ideal for HCL applications. Health care counselors are looking in particular at using HCL theories to treat individuals who suffer from depression or anxiety disorders. LED lighting engineers have also focused extensively on controlling and eliminating light flicker in LED products. Light flicker has been linked with headaches and other health problems that reduce productivity and a general sense of well-being. As the uses and applications of LED lighting expand, individuals will also benefit indirectly from reduced carbon emissions from power generation facilities. LED lights generate the same or better illumination as incandescent bulbs with 50% less energy input. Lower power demands and reduced emissions will improve environmental air quality for everyone’s benefit. LED fixtures are also manufactured with no hazardous materials, and when they reach the ends of their useful lives, they can be discarded with no concerns over adding hazardous materials to landfills. Most people have an innate understanding of how lighting can affect the overall mood of an environment. They install dimmer switches in dining rooms and other parts of their homes to set a warmer feel when lights are low. In the dark days of winter in northern climates, therapists will even recommend special full-spectrum lighting that mimics sunlight to help alleviate symptoms of Seasonal Affective Disorder. 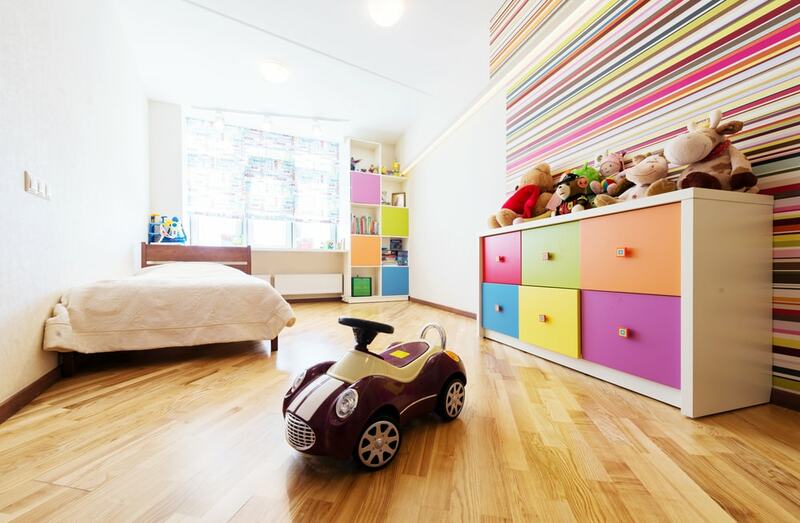 Modern LED lighting systems are now taking this relationship between light and mood to its next level. SpecGrade lighting engineers are experimenting daily with uses of LED lighting that directly improve mood and physical health with advanced optics and color temperature variance. LED lighting is uniquely suited to uses in the burgeoning field of human-centric design because of the high level of control that these systems offer to operators. LED lighting systems can be configured with rapid on-off switching and many different lighting wavelengths, colors, and lighting temperatures that can be combined and controlled with pinpoint accuracy to create an almost infinite variety of lighting configurations. The control systems for LED lighting provide maximum flexibility with easy and efficient setup or reconfiguration when needed. One specific example of the advantages of LED lighting in this field is in its use to generate lighting wavelengths that can increase awareness and productivity. Scientists who study biofeedback have long known that human eyes are particularly susceptible to blue light. This knowledge has led to recommendations that individuals who have trouble falling asleep should avoid light sources that might be high in blue light, including smartphones and computer tablets. Light sources that are high in blue light will suppress an individual’s melatonin production, a hormone that facilitates sleep. So to help individuals wake up from a period of sleep, LED lighting can be configured to increase blue light wavelengths. Conversely, when individuals are trying to get to sleep, LED sources that have relatively lower blue light wavelengths will help to create a more relaxing environment conducive to natural circadian rhythms. NASA scientists have relied on this light- and sleep-interaction to change ambient lighting on missions in order to help astronauts get better sleep in space. Healthcare researchers are also using LED lighting systems to treat depression and other psychological disorders. In addition to suppressing the sleep-inducing melatonin hormone, certain light wavelengths can increase an individual’s serotonin levels. Pharmaceutical treatments for depression typically include a form of selective serotonin uptake reinhibitors (“SSRI’s”), which combat depression by preventing an individual’s body from metabolizing seratonin. At least one study has concluded that exposing individuals who suffer from depression to certain light sources is as effective in maintaining and improving serotonin levels as those prescription medications, which is a big revelation in the mental health field where pharmaceutical medication has been the go-to solution for years. LED lighting engineers are on the cutting edge of producing lighting systems that directly improve an individual’s mood and health, which goes beyond the more traditional role of lighting that sought only to set the mood of a whole room. A simple retrofit of your existing lighting infrastructure with specification grade, high-performance LED luminaires can change your performance environment even today.